I guess one could say that Rancho de Char Mar had it’s beginning in a little boy’s dream the first time his dad took him whitetail hunting in Central Texas. After many years, some luck, and alot of hard work put forth by Charlie and Margaret Hilsberg (David’s Parents). The dream has become a reality. In tribute to Charlie and Margaret for all those many years of sore backs and much sweat, David and Penny felt it only appropriate for the ranch name to be Rancho de Char Mar. At the encouragement of a veterinarian friend, David and Penny attended their first Texas Deer Association Convention in 2004. At that convention a decision was made to become deer breeders and down the road start a whitetail hunting operation. We have started our operation as Whitetail Deer Season opens this October 2012. Please take a look at our Whitetail Hunting tab at the top of this page. “I have been hunting CHARMAR Ranch with my two sons for the last five years. It is a beautiful ranch nestled in the northern hill country of Texas, just outside of Gatesville. 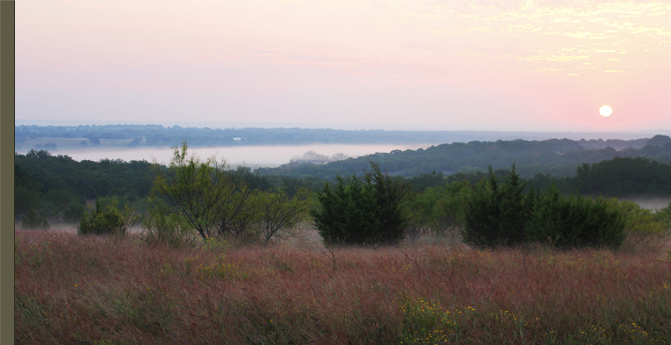 The landscape consists of rolling hills, valleys, open fields, dense brush, pecan trees, water holes, and a live creek. The ranch is also loaded with wildlife including trophy deer, quality native deer, hogs, game birds, and even an occasional pheasant. “Each year we anxiously awaited the opening of deer season and each year has been extremely rewarding. Our first year at the ranch, while hunting from a portable blind near the creek bed, we took a beautiful native 10 point buck. It was an early fall morning and the boys were able to witness the buck majestically walk out from the creek bed and present a shooting opportunity. It was a great experience for everyone, and the shoulder mount in our game room serves as a reminder of that great fall morning. Each season has been equally rewarding and has resulted in my boys taking their first deer, including this past season (fall 2010) when we took another beautiful native 10 point buck, with 3 kickers. Our trophy room consists of several reminders of the great hunts we have had at CHARMAR Ranch, including two shoulder mounts and several European mounts.